Product prices and availability are accurate as of 2019-04-24 05:51:16 UTC and are subject to change. Any price and availability information displayed on http://www.amazon.com/ at the time of purchase will apply to the purchase of this product. 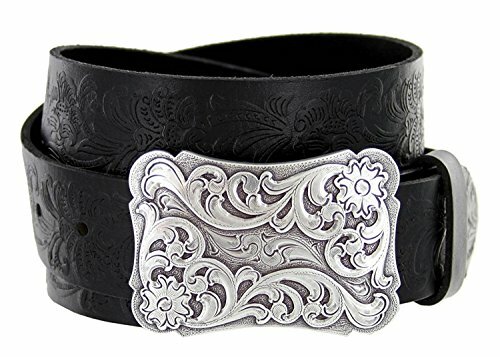 Western belt with Sterling Silver finish Buckle snaps onto a 1 1/2" wide belt. Belt has snaps so Buckle is removable and Changeable. 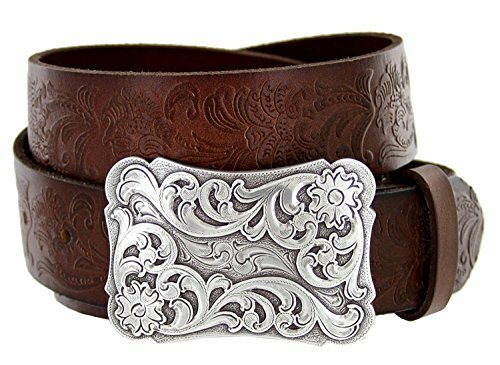 100 % Genuine Leather belt, will never split half. Sterling Silver finish Buckle snaps onto a 1 1/2" wide Belt Floral Embossed Leather Jean Belt Black, or Brown 100 % Genuine Leather belt, will never split half. Belt has snaps so Buckle is removable and changeable. Belt is measured from where the leather ends at the buckle end to the middle hole at the tip end. In order to get your size, measure the belt the works for you from the fold at the buckle to the hole where you wear the belt.